You would have thought the idea of building a team for a 24 hour race, where the plan was to race KTM Adventure motorcycles, would have been a difficult sell. Nope. 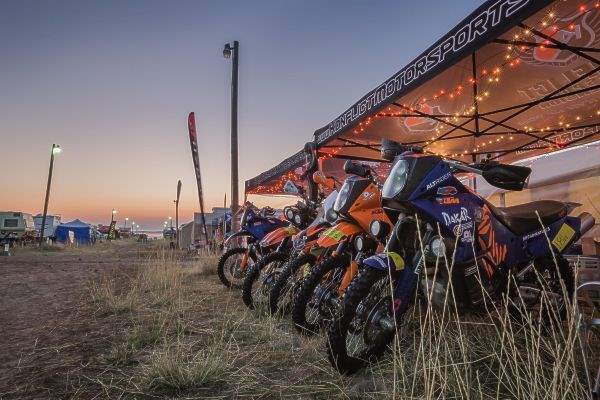 The brainchild of Darryl VanNieuwenhuise, CEO of Cyclops Adventure Sports, he was able to quickly put a team of riders together brave enough to race their KTM Adventure against the much lighter 450’s that would be the norm. Darryl first pitched the idea to Alex Martens of Konflict Motorsports & Suspension who didn’t need any convincing to partner with Cyclops and build a team. 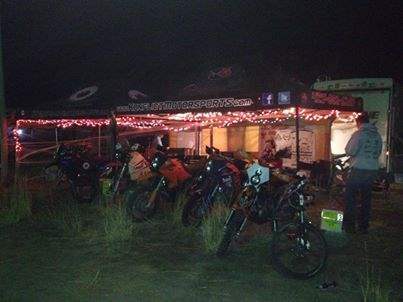 The call went out for others to participate in the quest to be the first team to compete at the Starvation Ridge 24 hour on adventure bikes. Didn’t take long, the PNW being one of the best places in the country for dual sport riding, there was no shortage of volunteers willing to participate in this crazy idea. The team that resulted was impressive. Veteran off road racers with a combined resume that included AA wins, Baja 1000 finishes and previous 24 hour class champions. The plan was coming together. The team was filled with 6 riders, unfortunately one of the riders was injured in a race prior to the 24 hour and the decision was made to move forward with 5. They’d be riding KTM 990 Adventures with the exception of Alex who would be racing his KTM Super Enduro. Next up was to try and round up some help. The team discovered that there were companies eager to get behind the effort. Before long they had Renazco Racing, Giant Loop, Klim, Tigatu Clothing and Ride Motorsports. The kicker was a very generous sponsorship from Coastal Instruments. Of course, Cyclops provided race lighting and Konflict ensured suspension was tuned perfectly for each rider and the expected conditions. The only concern the team had was weather. The last 2 years had seen rain turn the event into a mud bog. Probably the only conditions the big Adventure struggles in. As the event approached things were looking promising. The team was getting an unexpected amount of exposure and decided to use this to help the local community. They decided to hold a food drive. The food collected would be donated to the Goldendale Community Food bank. Using social media, the call went out for support. Thanks to the generous support of their sponsors they were able to offer a raffle to entice donations. Time went quickly, a couple team meetings to finalize plans and put the finishing touches on the race bikes, and race weekend was upon them. By race time the team now consisted of not only the 5 racers but a small army of dedicated supporters that included a pro mechanic, cook and others there to help in any way needed. It’s not often an amateur team gets this level of pit support. The Over The Bars Gang have been hosting the Starvation Ridge 24 hour for almost 10 years. Held on eastern WA farmland, the course is a 21 mile mix of natural and groomed terrain. Unique features making this event special include riding through an old farm house and barn. Everyone arrived Friday to set up and go over the bikes one last time. The Heavy Weights also decided to host a small reception to bring a little additional exposure to their sponsors. With team cook Ovi at the grill, the team prepared 35lbs of carne asada along with all the fixings for a taco bar, which of course included plenty of mexican beer. The plan worked and it wasn’t long before every bit of the carne asada and most of the beer had been consumed. While there were many comments about the undertaking, a couple were heard frequently, "You guys have big balls" and "you’re crazy". Believe it or not, there were even those who felt we were being disrespectful of other racers and were going to be nothing more than a roadblock. The goal now was to prove the naysayers wrong. Race day arrived with a spectacular sunrise and the forecast calling for sun and perfect racing temperatures. The riding order was set and Radek Burkat would be the starter. The organizer is famous for his starts and this year would be no exception. The riders bikes were lined up and the racers would then have to run 100 yards down a hill, through a ravine and then back up to their waiting bikes. Luckily, a 24 hour race is about consistency and not about getting the hole shot. Regardless, Radek gave it his all and got off the line towards the front of the pack. This year, 97 teams left the line. Radek’s first lap would be 54 minutes. The bar had been set. The rider change went smoothly and Jason Williams set out for his first look at the course. He set a time matching Radek’s. The 3rd rider, Darryl VanNieuwenhuise, was out after another flawless handoff. Darryl, an accomplished 24 hr racer, translated his skills easily to the big bike, turning the fastest lap yet. Next out was Alex Martens, riding a Super Enduro, he gave it hell and finished his lap without an issue. John Isenberg would be the last rider in the in the line-up and he hit the course like a man on a mission. After the first rotation it was obvious the riders were putting a beating on their bikes. The pit crewed stayed very busy during the early stages of the race to keep the team in the hunt. Luckily, things calmed down and they found their rhythm. Night came with the Heavy Weights running second Sportsman about 10 minutes behind the "Knuckle Draggers". They had overcome some significant challenges and were still in the hunt for a class win. As the sun dropped so did the temperatures, dipping to just above freezing by midnight. Then it happened, the one thing that will make even the best lights useless, fog. They had an ace up their sleeves and where using the new Cyclops Extreme LED Auxiliary lights. Using the amber filters the team ran some very good lap times in horrible conditions. By 2am it was so thick you could barely see your hand in front of your face. Luckily it only lasted a couple hours before a nice breeze picked up and moved the fog out. The team took the lead during the early morning hours. Spirits were running high but 2nd place had the gap to within 3 minutes. By sunrise the Heavyweights had slipped back into second. Apparently the Knuckle Draggers had turned loose their ringer for 5 straight laps. Turns out this ringer is none other than a former Desert 100 overall winner and is known for launching his snowmobile off giant cliffs. It was going to come down to the last few laps. The team felt good and knew that no matter the outcome they had proven that their effort wasn’t a joke and the big KTMs are capable off road machines. A plan to just be in it at the end had turned into a race. With 4 hours left, it had become clear that the Heavyweights were in the hunt for a win. Alex would get to ride the last. He put the hammer down and finished his 5th lap faster than any of his 4 previous. It was obvious that he'd left everything on the track and was exhausted. When Alex crossed the finish line for the final time, the transponder display showed the Heavyweights as class leader. It appeared that had they had overcome the deficit and had retaken the lead in the final laps. They had won their class racing KTM Adventures. Results were posted and confirmed the team had taken the Sportsman class win. High five’s were flying and competitors flooded their pit to offer congratulations on the historic accomplishment. Then the other shoe dropped. The team was asked to report to scoring for the outcome of a protest that had been filed by the Knuckle Draggers. Apparently there had been a sweep rider who had been issued a transponder (so they could be tracked) that was programmed with the same number the Heavyweights had been assigned. This had affected scoring and meant the Heavyweights had not won but instead finished 2nd behind the Knuckle Draggers, a mere 15 seconds separating them. No question, it was a roller coaster ride from beginning to end. Certainly disappointed to have not come away with the win, the team was still proud of their accomplishment and vowed to be on the line next year. The HeavyWeights want to personally thank the following for their help. Jonathan Blunt, Ovi Puida, Bob Williams, Jim Engle, Whitney Koberle Sandra Van Blouin, Heather Martens, and Clif Brown. The team’s accomplishment is a direct result of their hard work and dedication to the effort. Also important to note that with the help of donations made by other teams, the Heavy Weights donated almost 200lbs of food to the Goldendale Community Food Bank.